Imagine your phone buzzing you as you pass the local shop to remind you need to buy milk. Imagine a bank statement that automatically shows you which items to claim as expenses or where you overspent. Imagine storing your medical history online, being reminded when to take meds or re-order a script. Imagine the staff at your gym coming up to congratulate you on beating your personal best. All of that without ever setting a reminder, adding a diary note or logging in to an app. These uses aren’t futuristic; they’re already possible as we get more sophisticated at mapping, storing and cross referencing the huge amount of data we each produce every day. We provide a lot of personal data to publishers and brands’ online spaces, but beyond an attempt at more relevant ad serving, how does that really benefit us? The next big opportunity for marketers is, I think, something called ambient computing. In a nutshell this means that our apps and services check-in, register and reference where we are and what we’re doing without us consciously choosing to, or having to remember to log in or post a memo. The way we put information online is usually clunky, and our relationship with our personal data is strange. We essentially discard it, handing it over to the platform that spikes our interest. Of course there’s a trail of evidence of our interactions. But we don’t learn from it; we sip news and updates from an immediate stream rarely going back beyond 48 hours. Our web history and fastidious bookmarking is irrelevant as we rarely reference them again. Facebook’s timeline is a step towards giving us a glance at the past. Even Pinterest provides a better view of our gathered visual interests online, but it’s still a passive experience. I’m not saying that we want to go backwards. But accumulative data can give us insight for the future. The restaurant you liked, the one you didn’t. The fact that you sit down for 5 hours a day and need to get out more. Think of the next few years as an opportunity for transparent personal data that’s helpful to you as an individual. Your devices recording and cataloguing activity and presenting it back for review and insight. With personal activity information shareable at the user’s discretion brands and services can give a more tailored experience. For example personal GPS data cross-referenced with your bank statement and you’re immediately able to see your spending behaviour by location, what was work-related, where you overspent and so forth. In downtime during a bus ride your device can prepare a perfect length video for your journey. In the fast-growing category of personal fitness, claiming to “tell you more about yourself than you ever knew before”, the Nike+ Fuelband measures activity and duration and allows you to share it with your social networks (although the Nike branded metric of activity is questionable). It’s essentially helping people become more active by recognising their behaviours, empowering them to take charge and reach personal goals. 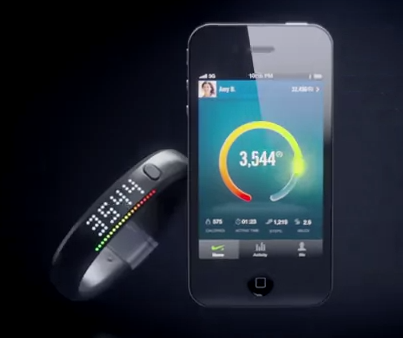 As part of SxSW, Nike opened the Fuelband’s application programming interface (API) to allow developers to integrate features into their apps or platforms. Essentially extending the service and its possibilities. Holding a mirror up to the user via their personal analytics is going to empower people no end. Coupled with technologies such as GPS, accelerometers and the information that surrounds us, digital can step up and be accountable and useful in our daily lives. Amber Case, Cyborg Anthropologist and founder of Geoloqi, said: “The best technology is invisible and gets out of people’s way to let them live their lives.” In her keynote address entitled “Ambient Location and the Future of the Interface” she showed devices that buzz when you’re going north, in doing so make the user better at locating themselves. Digital reminder notes that can be left where they’re most relevant. One of the most hyped apps at SxSW was Highlight, as Kim McKay pointed out in her piece yesterday. The Highlight mobile app allows users to discover people around them with similar interests or people in common. But it suffers from the challenges we face now, such as limited battery life and a solid network connection. it’s been cited as one to watch, but in truth join a host of similar services that start to work in the background rather than require us to fire up an app and request the service. It’s clear that “always on” will become the norm in the next year or two. So as a marketer you’ve probably got a desire to build an app, or your agency keeps pitching app ideas. The question – as ever with digital – is how can you add value for the user? But in this instance, with personal data, brands have the opportunity to add a layer that truly connects. Connecting information, from the user and the brand, to create new experiences and services that change lives. With this rise of ambient computing and transparent personal data, think how you can add to your consumers’ actual daily activity. Not only contextually relevant but actually useful, in the right place at the right time, and most importantly benefiting your user when they need you most. And so we all get dumber… and dumer… an duma…. Peter, really? I felt it would allow us to get smarter. We’d waste less time visiting these services and just get on with living. Fantastic as always Ben, thanks for the insight. mate, GREAT article. loved it. thank you. Really fires up the imagination – nice piece Ben. To me, – and admittedly, I’m taking this to the extreme – it conjures up images of a society like the Eloi from H.G Wells’ Time Machine. Great post Ben. A lot of these principles were hyped when WAP arrived on mobile. Now I think the tech has caught up with the thinking. Just don’t use a fitness app on Apple’s network or anything that syncs with Facebook. Unless you like the idea of your fitness data being sold to your health insurer. Sounds like we are moving towards an ‘always on’ content delivery model which now algorithmically matches content to your ‘lifestyle’/’the way you live your life, and your interactions’.